Underside of a DVD-R disc. 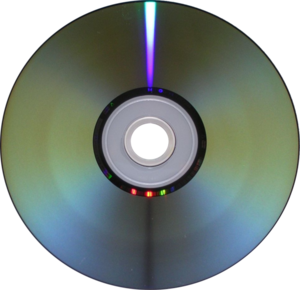 A DVD or Digital Versatile Disc is a optical disc storage media for digital data. It is mostly used for videos, but can also store any other kind of data. DVDs have the same shape and size as CDs, but are encoded in a different format and can store much more data. DVDs can be played in a DVD player or in a computer that has a DVD drive. Commercial DVDs usually have a copy protection. Spanking videos, which were mainly distributed on VHS video cassette tapes from the 1980s to the 2000s, are today usually available in digital form on DVDs, in addition or instead of video cassettes. This page was last edited on 18 August 2008, at 11:40.